After a long hard day at work it is nice to relax with a glass of wine. Flip Flop wines have a selection of wines that are affordable and taste good. I have always been a fan of any type of wine but my husband prefers red wines. Flip Flop Wines was started in 2009 by David Winter a organic vegetable farmer who learned the art of growing grapes. He developed a line of wines that were exceptional in taste and selection. There are seven varities of wines and each have their own distinct taste. I had the opportunity to try the Riesling and the Pinot Grigio. They both are fantastic wines and they had a distict taste all of their own. A medium bodied wine with peach, apricot and melon which lead to a satisfying, smooth finish. Is served chilled and tastes great with pork and chicken meals. This is a very sweet wine. Is Light-bodied and refreshing with tropical citrus, ripe pear and a zesty, clean finish. It has a dryer taste and goes great with Bruschetta, spaghetti carbonara, and eggplant parmesan. Although I liked both of the wines, I preferred the Riesling because of the sweeter taste and it was more full bodied. The taste was outstanding and tasted better than some of the more expensive wines that I had tried. Flip Flop has seven varieties to choose from and my husband cannot wait to try the Merlot. It is economically priced at $7.00 a bottle and can be purchased through Underdog Wine Merchants and shipped right to your home. I was very impressed with the wine and I plan to purchase them in the future. 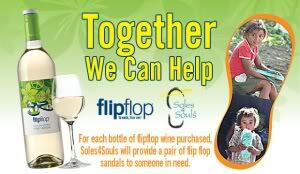 The folks at Flip Flop Wines and Underdog Wine Merchants have joined up with a wonderful charity called Soles4 Souls Inc., to donate a pair of flip flops (up to 100,000 pairs) for each bottle of wine sold. Did you know that many diseases and infections can be contracted through the feet and this can be prevented with a good pair of shoes. So go on out and buy a bottle of Flip Flop wine and help people in need. Disclaimer: I received two bottles of wine from Flip Flop Wines for my honest review and I was not compensated for my review.